Tom Herman has done this before. In his opening press conference as the new head coach of the Texas Longhorns, he ripped Charlie Strong a new one. Now, just over a year later, he’s throwing some serious shade at the former Longhorns head coach once again. On Tuesday as the Longhorns prepare for their Academy Sports + Outdoors Texas Bowl matchup against Missouri, Herman was at the podium. He was asked what he’s learned in Year 1 as the head coach at Texas, to which he responded, “That three straight losing seasons takes its toll on kids, it really does,” per Brian Davis of the Austin American-Statesman. To Herman’s point, Strong did go 6-7, 5-7, 5-7 during his three years at Texas. After saying that, Herman lamented the fact that he’s had to “reprogram” a lot of the players on his team. Herman on his current Horns: "They want to be great. They want to compete, but it's been a challenge to reprogram a lot of these guys." If Herman hadn’t burned Strong so badly right out of the gate, we could have brushed these comments aside somewhat. But given his initial comments, it’s clear he still blames the former Longhorns coach for some of his team’s struggles in 2017. Another huge issue Texas had this year was a rash of injuries. 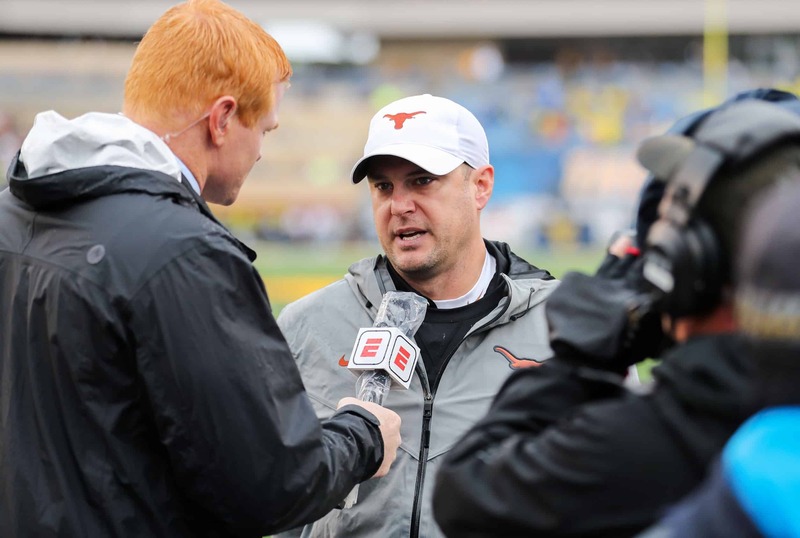 In the end, the Longhorns won just six games, though they did barely qualify for a bowl because of it. Herman also appears to have the program on an upward swing given his recent moves on the recruiting trail. But we’ll have to wait and see if they pay off in the long run. One thing we know for sure is that Herman won’t be receiving any Christmas cards from the Strong family in 2018.